A voice of hope and compassion, Delana. Born to House Delael, Delana was one of the heir apparent in her respective house,along with Dyl and Dama. All three were childhood friends that were groomed to eventually become leaders of the Celestial Guard, a sacred order of mage knights that serve all the lands within Lemithia. Where Chalrae protects the cities within Lemithia, the Celestial Guard protects the lands in between and on the outskirts of the realm. Delana was to be groomed as the High Cleric of the Guard, with Dyl being Captain of the Watch and Dama as Lord of the Roads. All this would have been set if not for the Lemithian Civil War, which divided the entire nation into separate kingdoms and splintered many established Orders and Groups. The Celestial Guard was one of them. 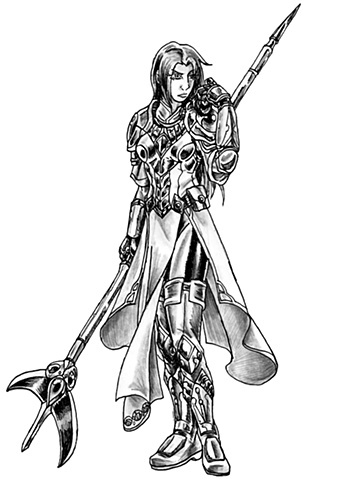 With House Dylael destroyed upon defecting to the Rawni Faction and House Damael severing all ties to the Celestial Guard, Delana became the sole benefactor of maintaining the remaining members of the Guard. Delana uses her mystical training to help compensate for the depleted roster to make it more of an immediate response force as well as establishing mystical safeguards within the capital of Lemithia. Though she bears the heavy responsibilty, she still hopes that the kingdoms shall unify one day, and hopefully, so too, shall her one love, Dyl. Delana I remade her uniform from her simple, yet effective attire into a more combative form. I tweaked her boots from normal to thigh, with armor plates for protection. I redid her breastplate and added armor to her arms, yet kept select articles of clothing flowing for her mystic background based on fantasy cleric references. I remade her staff, a halberd shaped like the moon with a jewel contained, but I may remake that halberd staff again as I am not completely sold on the jewel clusters I bestowed on her weapon and made remake it at a future time.